Luckily I arrived with no jet-lag in Berlin, because the next morning I had to rush at 8 am to the train station with cello and a huge suitcase in which I had only a few clothes plus my entire sound amplifying system (Bose L1) in order to be heard at all at the six different train stations awaiting me the next two days. First stop was the smaller station in Hamburg, called “Dammtor”. Charming station, not too far from where I had performed my very first Dvorak Concerto pretty exactly 23 years ago, at the famous Musikhalle, and here I was to open my mini-tour of performing all Bachsuites at train stations in Northern Germany. It didn’t start out so well: I had troubles connecting the amplifier to an electrical outlet, and once I succeeded I had to play the Suites Nos. 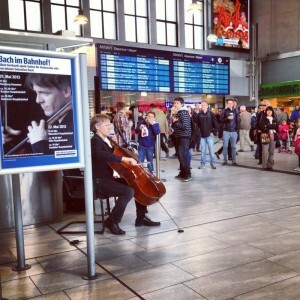 1 and 6 in front of only a few people – not the busiest of all stations, people did stop, but somehow it wasn’t the same experience like a year earlier, when I played all the suites at the Berlin main station and a lot of listeners had transformed my little platform into some kind of concert hall. I worked hard, but I must admit it didn’t feel right and I was afraid that maybe the success in Berlin had just been sheer luck and that it was indeed a silly idea trying to bring the Bach Cello Suites to travellers instead of just sticking to the good old concert hall or at least church. 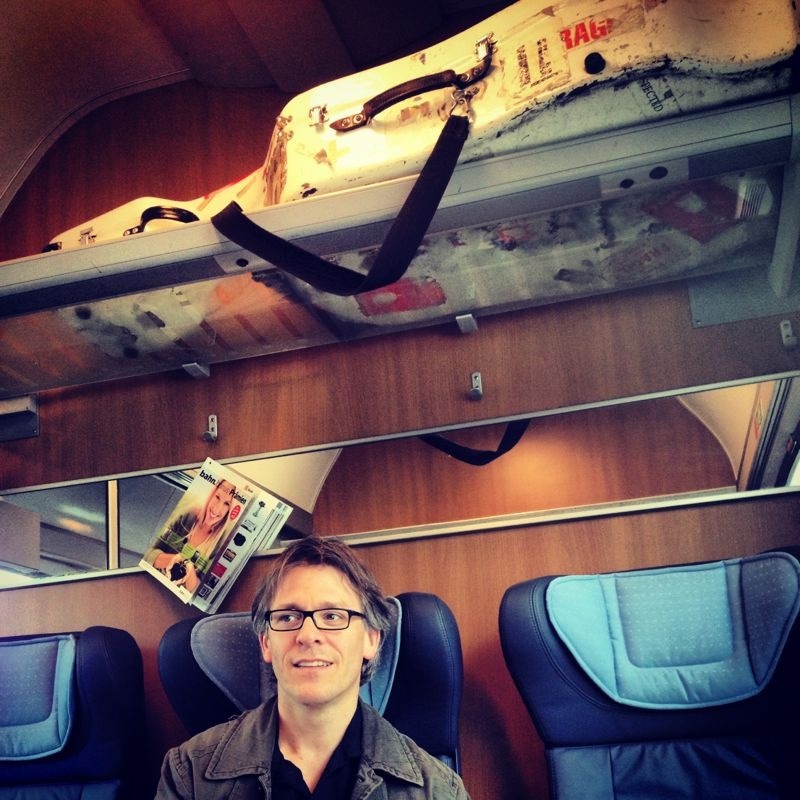 No time for complaints, next stop was Bremen – the train was in time, and while setting up my equipment already quite a big crowd gathered around me and made the performance of the Suites Nos. 2 and 5 a much more rewarding experience; they listened really well, this core audience of maybe 150, while many by-passers stopped for a couple of movements and then continued their way. 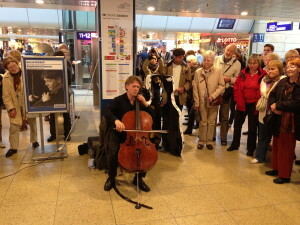 A former classmate of mine from University, now principal cellist of Munich Philharmonic, happened to be one of them, and we had a lovely talk afterwards, until I had to catch the next train to Hannover, where I sat in the middle of the train station’s “quasi shopping-mall”, being grateful that I had my amplifier, otherwise I would not have heard myself. 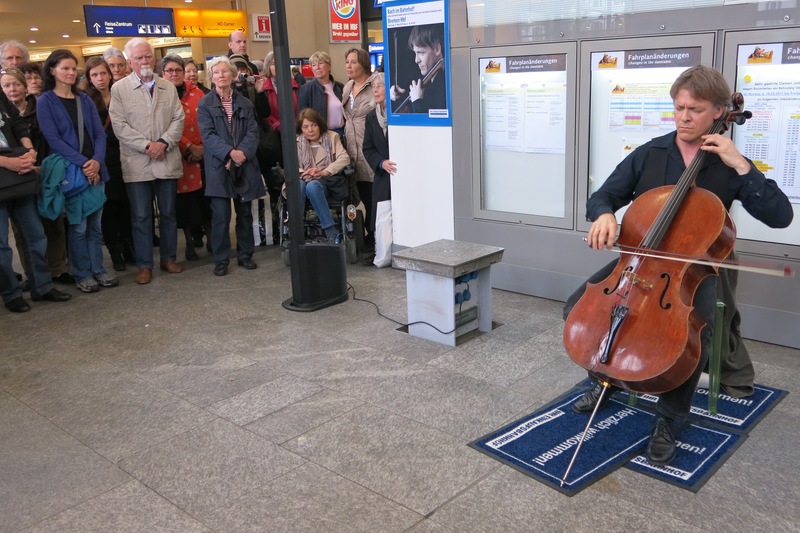 My friend and pianist Markus Becker had come with his entire family, but also lot of strangers formed another great crowd, even though I must admit I was very nervous by having friends listen as I somehow felt insecure about what they would be thinking about this kind of outreach. Normally I don’t tend to worry too much what other people think of my actions, but I really don’t want to disappoint my few close friends, especially since I do have my problems with getting through the 3rd Suite without blackouts… Everybody seems to be most afraid of playing the 6th Suite, but I personally find the C-Major the hardest, haven’t done it too often yet. 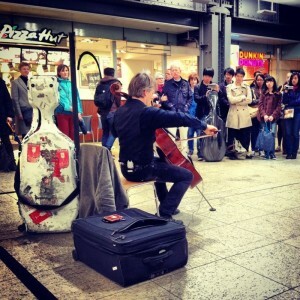 It’s quite a challenge playing for people who don’t really want to listen, hard to make them stop in their routines and give you an ear, almost impossible to ever get the attention and silence to play really soft – but if it works it’s an amazing feeling, and in Hannover it did happen a couple of times, where I felt the station being as quiet as it gets and the people standing around in a half circle transforming this space into an auditorium. There was an article about art in my favorite paper, “Die Zeit”, and the writer Jens Jessen explained that often it is the space which makes art to what it is, especially with some modern art, which only becomes art because it is exposed in a museum. Well, in this case, the “art” was creating it’s own space, Bach’s music is of such power, that the most mundane of all places, an ugly train station, can become some kind of temple of art, to be a bit melodramatic. Last stop was in Frankfurt. Train was almost an hour late which made me change connections to save the gig – and it worked. This was almost the most satisfying of places, somehow audience and architecture of the station worked together incredibly well, I felt most inspired and dared to take more risks than ever with these middle suites (again I had coupled Nos. 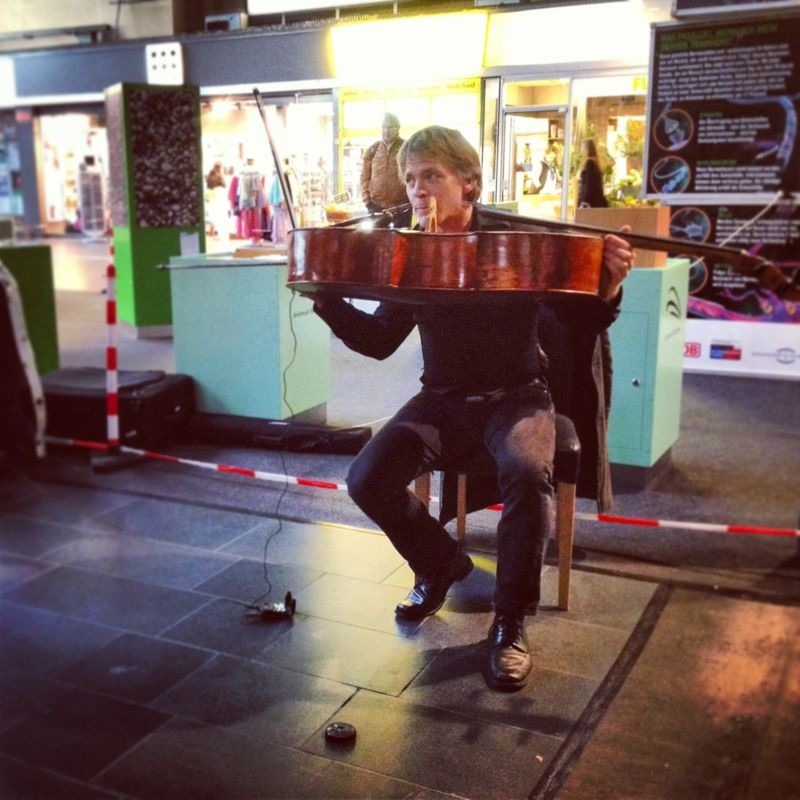 1+6 in Düsseldorf, 2+5 in Cologne and 3+4 in Frankfurt) to the extent that at last I feel somewhat more connected with C major, the 3rd Suite. What I got out of this mini-tour? Above anything stamina, I’d say – it’s quite brutal on the body having to perform in such surroundings such serious music; quite a task for concentration to stay focused amidst all that noise and distraction going on, but having gone through it twice within two days, I feel more confident that I can play these suites anywhere now. 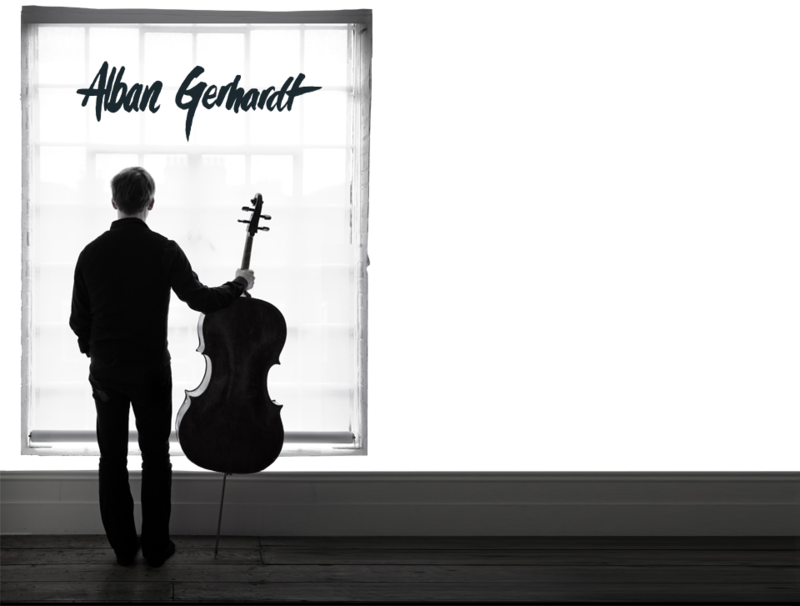 It is so much easier to play for people who pay to hear you and who know what expects them – in a public space you have to work so much more to make “it” happen, but if it happens, it is even more rewarding. Wish somebody would take up such a project “impromptu” in US. I remember Joschua Bell did something similar but on a small scale – single city -near Washington DC a while back and he didn’t a specific musical program in mind. Will Bach’s music have the power to make lasting impact/impression on passer-by journey-person inside a busy train station in the US ?